This is a Chinese name; the family name is Ting. Samuel Chao Chung Ting (born January 27, 1936) is a Chinese-American physicist who received the Nobel Prize in 1976, with Burton Richter, for discovering the subatomic J/ψ particle. He is the founder and principal investigator for the international $2 billion Alpha Magnetic Spectrometer experiment which was installed on the International Space Station on 19 May 2011. 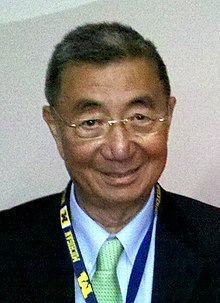 Samuel Ting was born on January 27, 1936, in Ann Arbor, Michigan, United States of America. His parents, Kuan-hai Ting (丁觀海) and Tsun-ying Jeanne Wang (王雋英), met and got married as graduate students at the University of Michigan. His father was from Rizhao County (日照縣) and his mother was from Haiyang Country (海陽縣), Shandong province in Mainland China. Ting's parents returned to China two months after his birth. Due to the Japanese invasion, his education was disrupted. Because of the Chinese Civil War and the subsequent split of China into the two separate regions, his parents moved to Taiwan and started to teach engineering at National Taiwan University (NTU). 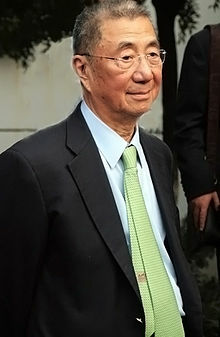 From 1950, Ting attended Chien Kuo Middle School and Taiwan Provincial Engineering College (now National Cheng Kung University), but he completed his college studies in the US. In 1956, Ting was invited to attend the University of Michigan. There, he studied engineering, mathematics, and physics. In 1959, he was awarded B.S.E. (in mathematics) and B.S.E. (in physics), and in 1962, he earned a doctorate in physics. In 1963, he worked at the European Organization for Nuclear Research (CERN). From 1965, he taught at Columbia University and worked at the Deutsches Elektronen-Synchrotron (DESY) in Germany. Since 1969, Ting has been a professor at the Massachusetts Institute of Technology (MIT). Ting was awarded Ernest Orlando Lawrence Award (in 1976), Nobel Prize in Physics (in 1976), Eringen Medal (in 1977), DeGaspari Award in Science from the Government of Italy (in 1988), Gold Medal for Science from Brescia, Italy (in 1988), and NASA Public Service Medal (in 2001). In 1976, Ting was awarded the Nobel Prize in Physics, which he shared with Burton Richter of the Stanford Linear Accelerator Center, for the discovery of the J/ψ meson nuclear particle. They were chosen for the award, in the words of the Nobel committee, "for their pioneering work in the discovery of a heavy elementary particle of a new kind." The discovery was made in 1974 when Ting was heading a research team at MIT exploring new regimes of high energy particle physics. In reality, a theory in natural science cannot be without experimental foundations; physics, in particular, comes from experimental work. I hope that awarding the Nobel Prize to me will awaken the interest of students from the developing nations so that they will realize the importance of experimental work. In 1995, not long after the cancellation of the Superconducting Super Collider project had severely reduced the possibilities for experimental high-energy physics on Earth, Ting proposed the Alpha Magnetic Spectrometer, a space-borne cosmic-ray detector. The proposal was accepted and he became the principal investigator and has been directing the development since then. A prototype, AMS-01, was flown and tested on Space Shuttle mission STS-91 in 1998. The main mission, AMS-02, was then planned for launch by the Shuttle and mounting on the International Space Station. This project is a massive $2 billion undertaking involving 500 scientists from 56 institutions and 16 countries. After the 2003 Space Shuttle Columbia disaster, NASA announced that the Shuttle was to be retired by 2010 and that AMS-02 was not on the manifest of any of the remaining Shuttle flights. Dr. Ting was forced to (successfully) lobby the United States Congress and the public to secure an additional Shuttle flight dedicated to this project. Also during this time, Ting had to deal with numerous technical problems in fabricating and qualifying the large, extremely sensitive and delicate detector module for space. AMS-02 was successfully launched on Shuttle mission STS-134 on 16 May 2011 and was installed on the International Space Station on 19 May 2011. Honorary Fellow, Tata Institute of Fundamental Research (2004). Since both my parents were working, I was brought up by my maternal grandmother. My maternal grandfather lost his life during the first Chinese Revolution. After that, at the age of thirty-three, my grandmother decided to go to school, became a teacher, and brought my mother up alone. When I was young I often heard stories from my mother and grandmother recalling the difficult lives they had during that turbulent period and the efforts they made to provide my mother with a good education. Both of them were daring, original, and determined people, and they have left an indelible impression on me. When I was twenty years old I decided to return to the United States for a better education. My parents’ friend, G.G. Brown, Dean of the School of Engineering, University of Michigan, told my parents I would be welcome to stay with him and his family. At that time I knew very little English and had no idea of the cost of living in the United States. In China, I had read that many American students go through college on their own resources. I informed my parents that I would do likewise. I arrived at the Detroit airport on 6 September 1956 with $100, which at the time seemed more than adequate. I was somewhat frightened, did not know anyone, and communication was difficult. In 1960 Ting married Kay Louise Kuhne, an architect, and together they had two daughters, Jeanne Ting Chowning and Amy Ting. In 1985 he married Dr. Susan Carol Marks, and they had one son, Christopher, born in 1986. ^ a b Ng, Franklin (1995). The Asian American encyclopedia. Marshall Cavendish. pp. 1, 490. ISBN 978-1-85435-684-0. ^ a b "About The Programs - Personal Journeys: Samuel C.C. Ting". A Bill Moyers Special - Becoming American - The Chinese Experience. 2003. Retrieved June 2, 2014. ^ a b c "Samuel C.C. Ting - Biographical". Nobel prizes and laureates. Nobel Foundation. 1976. Retrieved June 3, 2014. ^ "The Nobel Prize in Physics 1976". nobelprize.org. Retrieved 2009-10-09. ^ "Experimental Observation of a Heavy Particle J". Physical Review Letters. 33 (23): 1404–1406. 1974. Bibcode:1974PhRvL..33.1404A. doi:10.1103/PhysRevLett.33.1404. ^ "Samuel C.C.Ting - Banquet Speech". Nobelprize.org. Nobel Media AB 2013. Dec 10, 1976. Retrieved June 1, 2014. ^ "Alpha Magnetic Spectrometer - 02 (AMS-02)". NASA. 2009-08-21. Archived from the original on 2009-08-16. Retrieved 2009-09-03. ^ William Harwood (2011-05-19). "Endeavour astronauts install $2 billion cosmic ray detector". cbsnews.com. Retrieved 2019-04-18. ^ Jeremy Hsu (2009-09-02). "Space Station Experiment to Hunt Antimatter Galaxies". Space.com. Retrieved 2009-09-02.